Until the late twentieth century, and then only in developed countries, the mortality risks associated with childbearing were substantial. Although there are risks to infants, the following entry focuses on the mortality risks faced by mothers. Maternal mortality is measured by the maternal mortality ratio, which is the number of deaths related to pregnancy per 100,000 live births. Getting an accurate measure of the maternal mortality ratio in many parts of the world is difficult primarily because one needs reliability in both the number of pregnant women and in the number of live births. A pregnant woman may die, perhaps due to an illegal abortion, but her death is not counted as pregnancy related either because her pregnant status is not ascertained or that information is withheld due to religious/moral convictions. In addition, maternal deaths extend to forty-two days past delivery or past pregnancy termination; if a woman is not receiving any medical care in the immediate postpartum period, her death may not be attributed to childbearing. The number of live births is not available in the countries that do not have a birth registration system. Even among countries that do, there may be systematic differences between countries in the designation of a birth as "live." Thus statistics on maternal mortality for all but the most developed countries are best-guess estimates only. At the turn of the twenty-first century, there were substantial differences in maternal mortality. According to Women's International Network News figures, the number of maternal deaths worldwide per 100,000 live births is 430, with a sharp division between developing countries, where the maternal mortality ratio is estimated to be 480, and developed countries, where the ratio is 27. These ratios can be translated into women's lifetime risk of dying from pregnancy/pregnancy-related reasons: 1 chance in 48 in the third world contrasted with 1 in 1,800 in developed countries. The highest maternal mortality levels are found in eastern and western Africa; Mozambique's maternal mortality ratio is among the highest in the world at 1,500. The lowest levels occur in northern Europe. Maternal mortality is the result of any number of complications that beset pregnant women worldwide. The most common direct causes of maternal death are severe bleeding (25%), infection (15%), unsafe abortion (13%), eclampsia (pregnancyinduced hypertension, often accompanied by seizures, 12%), and obstructed labor (8%). Fundamental to the reduction of maternal mortality is the identification of the wider social, economic, health, and political factors that are associated with it, an area that is the subject of considerable debate among policymakers. Some argue that maternal mortality is an unusual public health problem in that it is primarily affected by institutionally based medical interventions. This viewpoint is unusual in that most causes of death have responded more to public health initiatives (e.g., clean drinking water, sanitation) than to medical interventions. According to this view, the way to reduce maternal mortality is through the provision of emergency obstetrical care. In contrast, others argue that the key factor in maternal mortality is the disadvantaged status of women, a position that reframes maternal death as a social justice issue. Maternal mortality is viewed as the accumulation of a number of risks that girls and women face (e.g., malnutrition, female genital mutilation, premature marriage and pregnancy, lack of family planning mechanisms for child spacing) that reflect the relative lack of status and worth accorded to them in certain countries. Both medical and social factors play important roles in maternal mortality. There is clear evidence that medical interventions are important in reducing maternal mortality, as long as those interventions are performed by trained personnel. Especially important is competent emergency obstetrical care. Research done in rural Gambia shows that prenatal care is far less effective than emergency care in reducing the rate of death related to childbirth. This fact may be because many of the life-threatening complications that accompany pregnancy and delivery cannot be predicted for individual women. Also important is the provision of family planning services, which operate to lower the number of births and thus reduce the risk of maternal death. Evidence on the importance of social factors in maternal mortality is less well documented. Overall maternal mortality is much lower in societies in which women have higher educational levels and higher social status. However, there is no direct one-to-one relationship between improvements in women's social conditions and reductions in maternal mortality. Nevertheless, access to legal abortion is important in reducing deaths because legal abortions are more likely to be performed in a clean environment by trained medical personnel. It is estimated that about one-half of abortions lead to maternal death in Indonesia where abortion is illegal; this translates to the deaths of nearly 1 million women per year. In certain third world countries, the provision of safe and legal abortion is bound up with cultural views about gender roles, and is intimately related to women's position in society. Figure 1 shows the trend in the maternal mortality ratio in the United States over the course of the twentieth century. 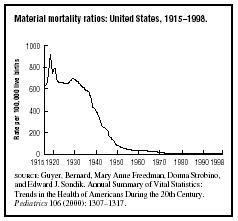 Maternal mortality ratios were over 600 (somewhat higher than in the contemporary developed world) until the early 1930s, when decline commenced. (The high rates around 1920 are likely due to the global influenza epidemic.) Compared to general American mortality decline, this is a late starting date; reductions did not occur despite an increasing proportion of deliveries in hospitals, the introduction of prenatal care, and the increased used of antiseptics in labor and delivery. Tworeasons have been given for the lack of reduction in maternal mortality during the first third of the twentieth century: Women either received no care or care in which the attendant did not recognize the severity of complications; and women received improperly performed medical interventions. It is likely that the second reason was more of a factor because unnecessary or improperly performed interventions and a lack of careful antiseptic procedures were common during that time period. The huge decline from the mid-1930s to the mid-1950s (from 582 to 40) has been attributed to a number of factors: the shift in responsibility for maternity care to obstetricians; the introduction of new antibiotics, the establishment of blood banks (along with blood typing and transfusion procedures); the introduction of safer types of anesthesia; and safer use of forceps. A good portion of the decline from the mid-1950s is due to declining infections related to septic abortion, resulting from the liberalization of abortion laws starting in the early 1960s and the legalization of abortion in 1970. Although the timing of the decline in maternal mortality was late in the United States relative to general declines in mortality, the same can be observed for England and Wales. With improved living conditions (e.g., nutrition, sanitation), the nineteenth century saw reductions in infant mortality and in deaths due to infection, with little benefit from medical advances. However, reduction in maternal mortality had to wait upon the development of medical interventions and procedures, and their proper use. While later declines were dependent upon social and political change (i.e., acceptance of abortion), the early and very large decline in maternal mortality was the product of medical advance. The dependence of safe childbirth on medicine is at odds with a trend commencing in the late twentieth century in Western societies to return to an idealized demedicalized childbirthing past. The evidence is compelling that medicine is key to safe childbirth. ratio (19.6) that is nearly four times higher than white women (5.3). The reasons for the racial disparity are not clear. Some of the factors that are likely involved include racial differences in susceptibility to high blood pressure, a leading cause of maternal death; general health; and receipt of high-quality prenatal care. However, generalizations are difficult, especially given state differences. For example, the maternity mortality ratio for African Americans varies from a low of 8.7 in Massachusetts to a high of 25.7 in Washington, D.C. The rate of decline in maternal deaths had stalled, and persistent racial differences—showing a substantial African-American disadvantage—remain. Yet, almost no research, either by biomedical or by social scientists, is addressing these issues. As a result, the safe motherhood goal of maternal mortality less than 3.3 has not been achieved in America. Cook, Rebecca J. "Human Rights Law and Safe Motherhood." Women's International News Network 25, no. 3 (1999):20. Greenwood, A. M., B. M. Greenwood, A. K. Bradley, et al. "A Prospective Study of the Outcome of Pregnancy in a Rural Area of Gambia." Bulletin of the World Health Organization 65 (1987):635–643. "Indonesia: Up to 50% of Abortions Lead to Maternal Death." Women's International Network News 26, no. 2 (2000):52. Luker, Kristin. Abortion and the Politics of Motherhood. Berkeley: University of California Press, 1984. Maine, Deborah, and Allan Rosenfield. "The Safe Motherhood Initiative: Why Has It Stalled?" American Journal of Public Health 89 (1999):480–483. "Maternal Mortality: A Global Review." Women's International Network News 24, no. 3 (1998):15–18. Population Reference Bureau. "Mozambique's High Rate of Maternal Mortality." Population Today, (April). Washington, DC: Author, 2000. "Racial Divide in Maternal Mortality." Society 27, no. 3 (2000):4–6. "State-Specific Maternal Mortality among Black and White Women: United States, 1987–1996." Morbidity and Mortality Weekly Report 48, no. 23 (2000):492–497. Wertz, Richard W., and Dorothy C. Wertz. Lying In: A History of Childbirth in America. New Haven, CT: Yale University Press, 1989.
i was wondering if any form of exercise can somehow have a positive impact on maternal mortality. if it can somehow help reduce it directly or indirectly.